The San Bernardino gunman had a history of domestic abuse, like most U.S. mass shooters. Students and parents comfort one another after a shooting at an elementary school on April 10, 2017 in San Bernardino, California. 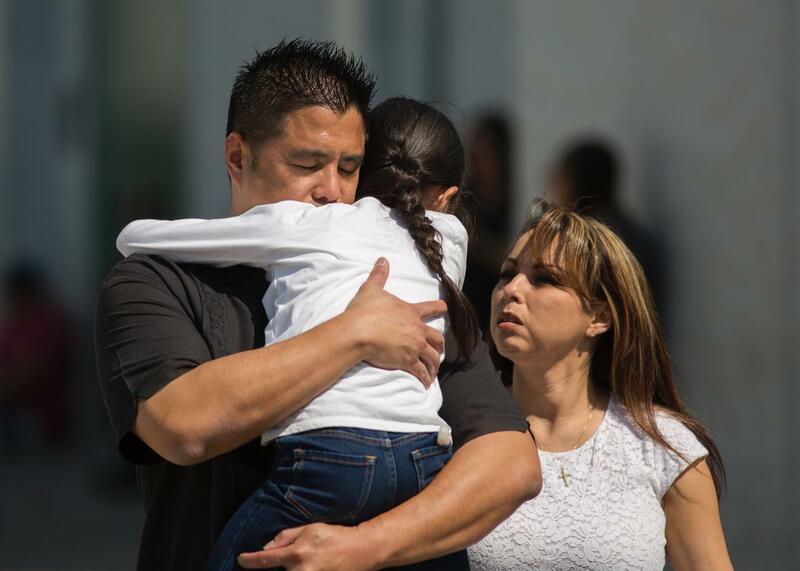 Monday’s elementary-school shooting in San Bernardino, California, left an 8-year-old student and a 53-year-old teacher dead and a 9-year-old student injured. Police say the gunman, 53-year-old Cedric Anderson, shot and killed himself after his shooting spree. He was the latest in a long line of American shooters whose histories of domestic abuse were warning signs, missed or ignored by authorities, of escalating violent tendencies. Federal law prohibits convicted domestic abusers (even those convicted of misdemeanors) from buying firearms, but gaping loopholes make that law alarmingly ineffective and unenforceable. It doesn’t apply to people who abuse their dating partners, just co-parents and legally married spouses, leaving what’s known as the “boyfriend loophole,” despite the fact that unmarried partners kill more U.S. women than husbands do. People convicted of misdemeanor stalking are also exempt from this law. Abusers can easily buy guns without background checks at gun shows, from private dealers, and on the internet. The biggest way around federal limits on domestic-abuser gun ownership is even simpler, though: In 41 states, convicted perpetrators of domestic violence can keep any guns they already have. The lack of strong legislation at the intersection of guns and domestic abusers puts women and children at a heightened risk of death. The mere presence of a gun in a home makes a domestic violence episode five times more likely to end in murder. A large study published last year confirmed that, accounting for all other measurable, relevant factors, states with higher rates of gun ownership see more murders of women by people they know. More guns mean more homicides in general in state-by-state data. But when researchers controlled for other factors like demographic differences between states, they found that gun-ownership rates accounted for just 1.5 percent of the increased rate of firearm killings of men, and a full 41 percent of the difference in rates of femicide. With this data to disprove the common conservative refrain that more guns beget safer women, there’s little question that flimsy, easily circumventable gun laws are a reflection of a political mainstream that’s willing to sacrifice women’s lives for the profits of gun manufacturers, contributions from the National Rifle Association, and the rights of men to feel powerful and cool. But domestic-abuse victims aren’t the only ones who suffer when perpetrators get access to guns. An Everytown for Gun Safety analysis of crime records calculated that, in 57 percent of U.S. mass shootings that occurred between January 2009 and June 2014, the perpetrator killed an intimate partner or family member. (Update, April 12, 2017: This week, Everytown reported an extension of the analysis through the end of last year, showing that the total is 54 percent for the 2009-2016 period.) In other words, the average mass shooter in America is a domestic abuser. Indeed, the world has gotten used to hearing from the U.S. that the shooter had a history of violence against women after yet another horrifying shooting spree. Cho Seung-Hui, the Virginia Tech shooter, was investigated for stalking two female students. Elliot Roger, who killed six people in Isla Vista, California, in 2014, tried to shove several women off a 10-foot ledge at a party and claimed in a “manifesto” that his violence was part of his “war on women.” Esteban Santiago, who killed five people in the Fort Lauderdale airport in January, was charged with assault and accused of choking his girlfriend in two separate domestic-violence complaints in the year before his mass attack. Omar Mateen, the man who killed 49 people and injured 53 at the Pulse gay club in Orlando last summer, reportedly physically abused and falsely imprisoned his ex-wife, Sitora Yusifiy. As Rolling Stone pointed out soon after the massacre, news outlets’ claim that Mateen had “no record of previous hate crimes” betrayed a very narrow definition of hate crime—when men abuse their wives, girlfriends, and exes, the violence is inherently misogynist. The most commonly-used definition of mass shooting requires that four or more victims be killed, so Anderson’s Monday attack in San Bernardino wouldn’t count in numbers like the 50-plus-percent statistic Everytown published. But, like Anderson’s, a great many domestic violence-related murders claim multiple victims. Last month, a man who reportedly abused his estranged wife allegedly killed her divorce lawyer, two of her co-workers, and a responding police officer in Wisconsin. Two weeks back, in Florida, a man allegedly used an assault rifle to kill his girlfriend and her son; he also wounded her other son, her father, and two bystanders. On Friday, a St. Paul, Minnesota man allegedly killed his ex-girlfriend, who he reportedly abused, as well as her sister and father; he also allegedly shot and injured her mother. And just two months ago, a 39-year-old man named Christian Omar Jacinto allegedly murdered his ex-girlfriend, Sophia Darlene Vasquez Rubin, as retribution for breaking up with him. Police officers found her bleeding on the ground, in the middle of a street in San Bernardino.